The efficient upkeep of Signal and Telecommunication assets is the responsibility of the Signal and Telecommunication Department of the Secunderabad division in South Central Railway. Secunderabad division is having 133 number of block stations with more than one lac number of Signaling assets such as Block instruments, Signal Units, Point machines, Track Circuits, Axle Counters ,IBs and IPS etc. These vital Signaling systems are essential and come under safety category for safe running of Trains. Telecommunications plays important role in the division and is associated with Safety Communication, Operational Communication, Administrative Communication system and Passenger Amenities in the station. The passenger amenities provided in the stations are Platform Clocks (Analog and Digital), Public Address System (Manual and Microprocessor based), Train Information Boards, Coach Guidance display boards, At a glance coach guidance display boards and Divisional Train Enquiry system with Touch Screens gives various types of information to the passengers. In the security front line, IP based surveillance system plays key role. In addition to these, various data networks like PRS (Passenger Reservation System), UTS(Unreserved Ticketing System)and FOIS (Freight Operations Information System) are being maintained by this division. Sr DSTE. Senior Divisional Signal and Telecommunication Engineer is in charge of the Signaling and Telecommunication Branch of this division. 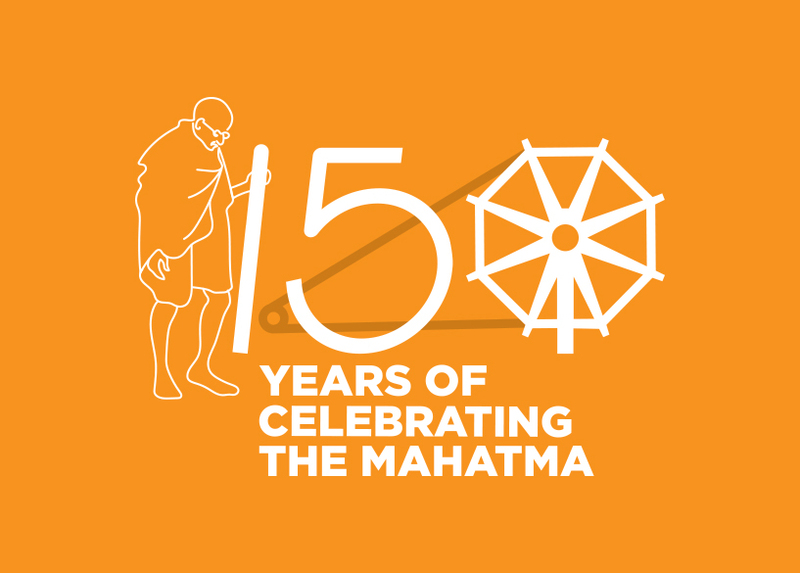 He is responsible to the Divisional Railway Manager for the maintenance as well as the correct functioning of the installations under his charge. He is under the technical control of the Chief Signal and Telecommunication Engineer to whom he is responsible for a technical matters. He will be assisted by a team of officers in different grades. 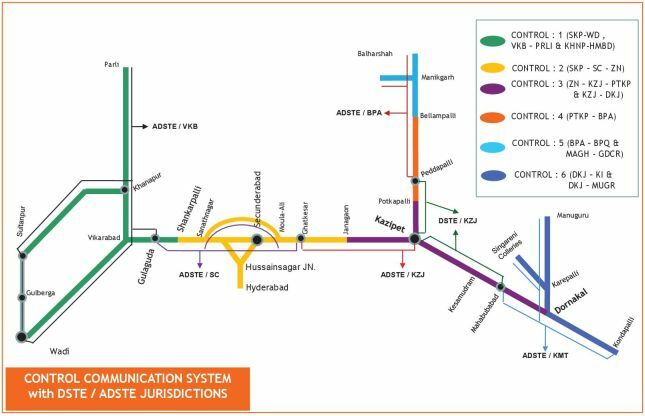 At 05 locations viz., KZJ ‘F’cabin, Raghavapuram, Ramgundam ‘B’ & ‘G’ cabins, Bellampalli ‘G’ Cabin, Executive software of Electronic Interlocking system (make : Ansaldo) has been upgraded from version CC 3.0 to CC 3.2 to improve the reliability of EI system. At 73 locations, as per railway board directives, circuit modifications have been done for total 113 no.s inner distant signals to prevent displaying top yellow in case of bottom yellow becomes blank. At 06 LC gates viz., LC 12 @ SSPD, LC 54 @ KHNP, LC 93 @ CKX, LC 107 @ PNF, LC 3 @ GDCR and LC 6 @ STBD, emergency sliding booms have been provided. 05 LC gates have been interlocked in 2016-17 and 16 manned LC gates having more than 20,000 TVUs are to be interlocked. At 05 stations, IPS (Integrated Power Supply) systems have been provided to avoid Blanking of signals. At 10 locations, Mini Integrated Power Supply (IPS) has been provided to improve the reliability of signaling system. At 35 locations, total 43 signals have been shifted from RHS to LHS to improve the reliability of signaling system. At 94 locations, Power Supply Availability Relay (PSR) circuit wiring has been done and connected to datalogger and SMS alert has been provided to indicate the failure of the system. At 28 stations, fire alarm detectors have been provided to improve the safety system. At Secunderabad/RRI, for S78, S77 and S1 signals, conventional multi lamp route indicators have been replaced with multi lamp route indicators ( LED based) to improve signal visibility. In stage I, 44 no.s of starter signals of 35 lines in 24 stations were shifted suitably to increase CSR up to 696-700 m.
In stage II & III, 70 no.s of starter signals of 62 lines in 35 stations were shifted suitably and along with concerned glued joint assembly towards SRJ to increase CSR up to 696-700 m.
At 23 stations, total 915 no.s of integrated LED aspects with modified version (LED + CR in one unit) of GAE make have been provided to improve the reliability. At 06 stations, Electronic Interlocking stations have been provided with ‘A’ class (Franklin rod) Lightening protection and RDSO Earthing to protect the signaling equipment from bad weather conditions. At all the 75 LC gates, the dead approach locking with 60 second timers has been provided to improve safety at interlocked level crossing gates. At LC 37 @ km 299/2-4 between Peddapalli-Kolanur, ‘C’ class, on ‘A” route, Approach Warning system (AWS) has been commissioned to improve the safety of signaling system. 07 LC gates, viz., LC 21 (NPL-SKP), LC 84 (UDGR yard), LC 25 (LPI yard) LC 94 (PPY yard), LC 36 (PDPL-KOLR), LC 9KK (KRA yard) and LC 59 (KZJ Yard) have been closed after construction ROB/RUB. The necessary alterations in signaling arrangement have been carried out. At Mallemadugu, Bhongir, Ghanapur and Ammuguda stations, total 07 no.s of ELDs (make : Anuvidyut) have been provided to improve safety. A Safety seminar has been conducted by Sr DSTE/Co-ord/SC for all SSEs/Signal & SSEs/Telecom of Secunderabad Division. CSTE/SCR, DRM/SC, CCE/SCR, Sr DEN/Co/SC, Sr DOM/SC, Sr DSO/SC, Sr DEE/TRD and Sr DEE/TRSO counseled the SSEs and participated the interaction session. 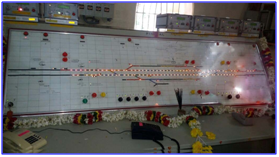 At Pindial, aged Relay room has been replaced with new one, along with new Domino type operating panel. At Mallemadugu, new relay room has been commissioned duly replacing old one. At Motumari station, 03 starter signals viz., S3, S4 and S5 have been provided with Shunt signals. Calling on cancellation time delay has been reduced from 240 seconds to 120 seconds and initiation time delay from 120 seconds to 60 seconds. 04 Mechanically Operated LC Gates have been replaced with EOLB (Electrically Operated Lifting Barrier). 03 new Stations and 01 LC of PDPL- NZB section have been commissioned by Construction organization viz., Lingampet Jagityal, Korutla, Morthad, Armoor, LC 3 and LPJL-MORTHAD section block working. 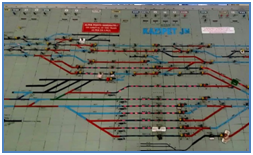 In view of yard alteration work, new operating panel (make:Podanur) has been replaced at Malkhaid Road (MQR). In connection with the provision of pit lines, new panel interlocking has been commissioned by Projects organization at Khanapur. At Nashkal, in connection with UP Loop line work , route setting type panel has been commissioned by Dy.CSTE/Con./SC. 32 LC Gates, 12 IBs and 06 Central locations have been provided with Remote Terminal Units. At Sirpurkaghaznagar -30 nos, Warangal’B cabin – 10 no.s of parallel track circuits have been converted into series-parallel to improve the reliability of power supply. At Dornakal Jn, GL1 and GL2 have been converted into Passenger lines to improve train operations. 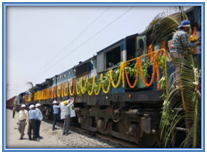 At 03 locations, Dual BPAC (Block proving axle counter) and at 06 locations, Dual BPAC (make : GG Tronics) has been commissioned to improve safety and reliability of signaling system. Provision of Conventional Ring Earths for BPACs: 69 no.s conventional ring earths using catenary wire have been provided for BPACs, whose value is less than 1 Ohm to improve the reliability. Work in progress for sections based on the failure rate. Fault Diagnostic & Communication Logics (FDCOM) have been implemented to give SMS to concerned Section officer, SSE, JE and ESM, that when a failure takes place fault will be triggered and alert SMS will be given showing the circuit and Relay name which was failed at 16 stations and 05 cabins (CHZ, GT, ALER, PBP, ZN, PQL, RGP, IPG, SKP, PGDP, YP, CVV, GNN, NSKL, BG, PPY, MLY’A Cabin, MLY’B Cabin, MLY Goods Cabin, WL’A Cabin, WL’B Cabin). In operating panel, 296 no.s of panel buttons (self restoring) have been completely replaced for all points, signals and common buttons at Kazipet /RRI. 3. 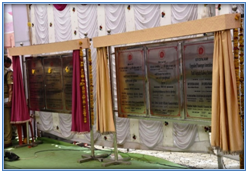 29 no.s of ‘A’ boards have been replaced with Retro- reflective ‘A’ boards in automatic sections (LPI-HYB – 22, SC-HSJn – 04 and SC-MLY – 03). CEL make SSDAC software version of MLB-1 & MLB-2 has been updated from 006 version to 007 version at 12 sections (PDPL-RGPM, JMKT-BGSF, BG-WP, YGL-NKD, PQL-NSKL UP & DN, PQL-KZJ DN, MLY’C’-CHZ DN). As a part of CSTE’s suggestion and Pre monsoon precautions drive, equi-potential bonding has been done for earths of Dual BPAC at 10 locations (MLY’C’ Cabin(DN Entry, UP Exit), CHZ(UP Entry, UP Exit), NPL-LPI (DN AS Entry and UP IB Exit), NPL-SKP (UP AS Entry and DN IB Exit) and SKP-NPL (UP IB Exit and DN AS Entry)). 6. Material Management System (MMS) software has been installed in 03 Store depot systems for implementing the computerization of all stores transactions that makes the working system accountable and helps in monitoring the same (Wireless, SC/RRI and Telecom Stores (FOTC)). 1. LC gate communication has been provided with Selective calling and Master and slave electronic gate phones at newly manned LC Gates No. 26, 31, 34, 36 between KRMR – LPJL section and for 03 newly manned LC Gates LC 6 MB (DKJ – KRA), LC 8 MB(KRA – SYI) and LC 14(MTMI – MAPA) with solar panel and 12V/42 AH will be commissioned after obtaining CRS sanction. 2. 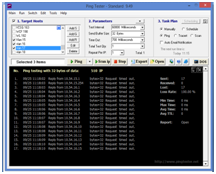 New software “ Ping Tester” installed in Network system at Test room/SC to test the V-LAN connectivity connected in the network individually with its IP addresses so that faulty can be identified immediately reducing the mean time to restore failure. Path connectivity of LAN can be tested and ping testing reports can be saved in the desired format. 3. Remote Terminal Units (RTU) have been networked for LC- 31, 32, 33 between PTKP- KOLR block section and connected to Data logger network on 29. 5. 2017. 4. 17 Nos. 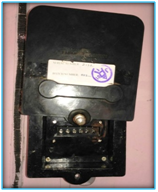 of Voice logging Electronic LC gate phones (Master & Slave units) have been provided at LC-5, 6 (HSP-KMTP), 8, 9,11,12, 13 (HSP-OPL) LC-14, 15, 16, 17, 18, 19, 20 (OPL-JMKT), 72, 73 (NKD-INK) & 76 (KDM-INK) respectively. This facilitates to retrieve the voice logging data during unusual. 5. 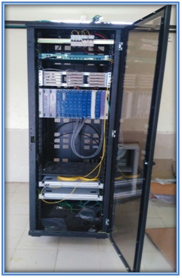 At LPI station, OFC electronics (STM-1&PD Mux) has been shifted from existing OFC prefab to newly constructed building and provided 24U Rack and necessary rewiring done. 6. BSNL SIM based FCT phones have been provided in place of BSNL WLL phones at 06 stations and 09 no.s New FCT phones along with Airtel CUG SIMS have been provided. a.) 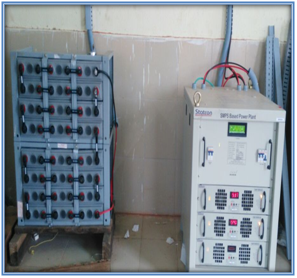 At Makkapet new OFC Electronics (STM-1 Tejas, Werfel Mux, 48V/200 AH HBL battery bank & Statcon charger) have been installed and commissioned by Rail Tel. b.) 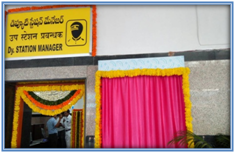 At Jagayyapet ‘B’ cabin, Revuru Ramapuram, Mellacheruvu and Mattampalli new OFC Electronics (STM-1 Tejas, Webfil Mux, 48V/200AH Amara raja battery bank & Statcon charger) have been installed and commissioned by Dy.Construction /BZA. 8. 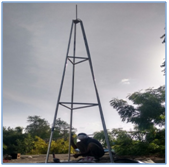 Lattice type Tripod Towers for 25Watt VHF communication have been erected at 14 stations for better Line Of Sight for VHF communication. 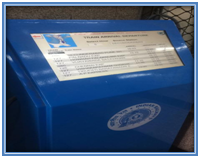 New FRP box type EC sockets have been provided at crew lobbies of 09 stations and counseled Loco Pilots and Guards in view of replacement of existing MS type EC boxes over the division. 11. Railnet connection has been provided to Crew Lobby/BIDR for digital caution order printing , SSE/Electrical/HYB for monitoring parameters of Solar plant , Dy.SS/PRLI, VKB, TDU, HYD and SC stations for taking print out of online digital caution orders as alternate to BSNL net. 13. RCIL Railnet has been provided at TDU, VKB, HYB and SC stations to take print outs of Online Digital Caution orders as an alternate to BSNL net. 14. 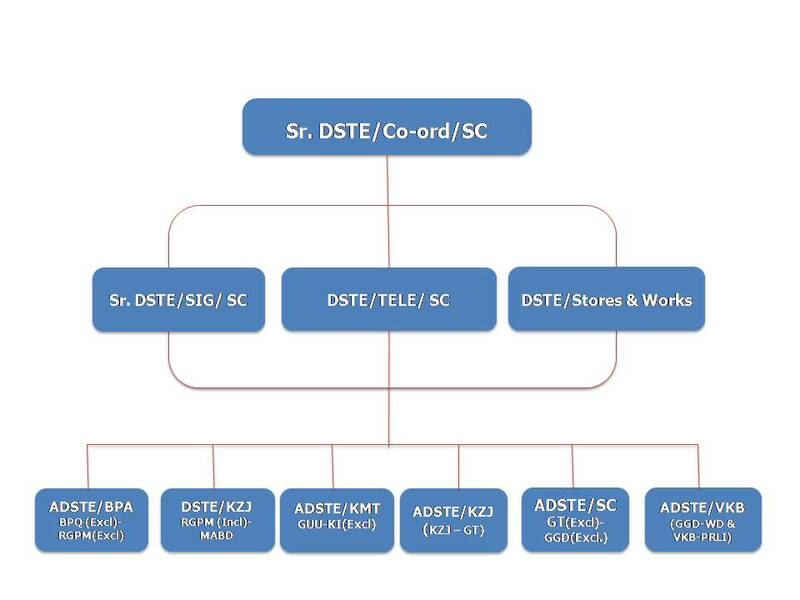 10 V-LANS have been created in bifurcated Datacom equipment of SC division which is installed at Test room/SC for distribution of rail net connectivity to all nodes in Sanchalan Bhavan of various departments as well as at wayside stations. 15. 120 Numbers of Nodes which are connected in PRIME network have been shifted to Rail net for utilizing facility of IPAS module. 16. NMDL (Network management of Data Logger) connectivity has been provided to SSE/SIG/TDU, JE/SIG/WL, LPI & BKL for monitoring and preventive maintenance of signaling gear and asset failures. 17. Fourteen Numbers 12 pair and two numbers of 20 pair Wago make cable termination boxes have been provided in Telephone Exchange at SNF for re- termination of various cables in place of krone make cable termination boxes. 18. All control boards are provided with 55" monitor and are connected through Data Logger networking for viewing the traffic movements at stations in the whole division. 19. Video surveillance system has been installed and commissioned at RRI/Stores/SC and online viewing from divisional office is extended. 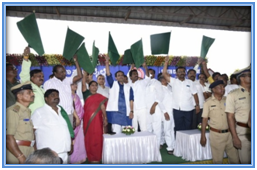 Secunderabad division has been awarded IGBT platinum shield and the advantages for rail users about the implementation and usage of green environment display notices have been provided. 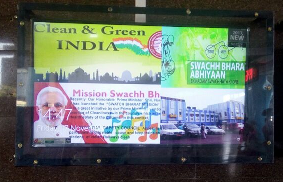 Video link has been extended to Railway Board from Rail Nilayam/SC to Penna Cement siding/TDU by hiring 4Mbps BSNL channel for Inauguration of new freight terminals and flagging off Goods train (Loaded) under mission Hundred by Hon’ble MR remotely from Rail Bhavan/New –Delhi . Two PA system have been provided at BIDR station for flagging off ceremony of Train No.22144 from BIDR – MUMBAI CSTM Tri weekly express Hon’ble MP & MLA in presence of DRM/SC and other dignitaries. 3. PA system, one no.of 8x10” LED screen, 10 nos. of 55” LED TVs and 10 nos. of pelmets for remote and local curtain openings have been provided at ‘PARLI’ station for inauguration of the following by Shri Suresh Prabhakar Prabhu, Hon’ble MR and Hon’ble Chief Minister of Maharashtra in presence of MPs, MLAs, GM/SCR and other dignitaries. b. 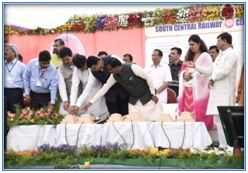 Laying of foundation stone for Parli – Beed section new line. Inaugurations via Remote Video Link. c) Dedication to the Nation - Two Lifts on PF1 and PF 2/3 at Nanded station. f) Dedication to the Nation- Improvement to façade and circulating area of Sholapur station. g) Dedication to the Nation- Improvement to façade and circulating area of Ahmednagar station. 4. PA system and 2 nos. of curtain opening pelmets have been provided at IRISET for passing out parade of officers and inauguration of Main Portico & Renovated Digital Classroom by DG/S&T in presence of GM/SCR and other dignitaries on 12.06.2017. 5. PA system with projector arrangements were done at Hotel Taj Krishna in connection with Railway Standing Committee Meeting. 6. Swachh Pakkwada programmes have been done at KZJ, ALER, GNP, SEM, VKB and KMT stations by all officers of SC Division. 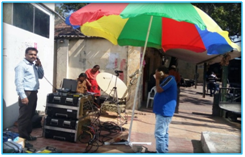 Necessary PA system arrangements have been done for the programme at all stations. 7. 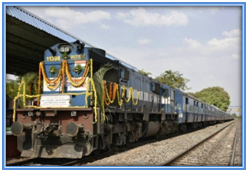 Hon'ble Prime minister inaugurated a new railway line from BIDAR to GULBARGA and all necessary telecom arrangements have been done in a record time. Five Nos. of old aged and outlived PA systems have been replaced with new PA systems of improved version at 05 stations. 11 Nos. of existing aged Touch Screen POETS have been replaced with new ones at 8 stations. 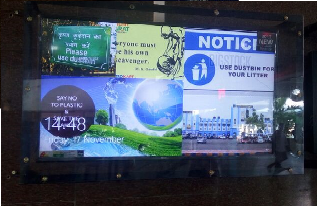 New one installed at PRLI station. 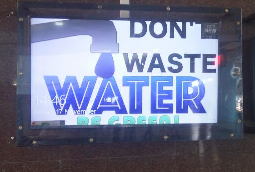 Necessary modification in Data base of CIB display boards to display as ‘PWD’ in English & “ दिव्य “ in Hindi in place of ‘SLR’ has been completed at 16 stations over SC division. 4. 25Watt VHF set, COIS circuit and 3 Nos. 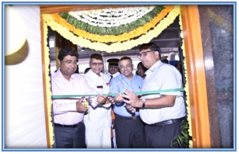 of Railway auto telephone connections (Commercial Dy.SS-86607, Guard booking-86624, Integrated station management system -86639) have been provided at newly inaugurated Dy.SS room by GM/SCR on 15.04.2017 at Secunderabad station PF No.1 in co-ordination with Rail Nilayam Exchange. 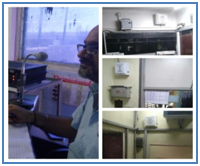 CCTV Surveillance system feed has been extended to the offices of H & MI (Health & Malaria Inspector) at SC, HYB, KZJ, WL, & KMT stations for monitoring of station cleanliness. 6. 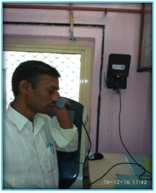 ‘Face to Face Enquiry system’ (Desk top communication) has been provided at general booking counter/Secunderabad as per the DRM/SC’s instructions. This facilitates better communication for passengers and booking office staff. 7. At Nagalapalli ‘D’ category Adarsh station, compact PA system with improved version has been installed and commissioned. 8. PA system (amplifier & Mike) has been provided at RRI/SC and the feed of amplifier has been extended to enquiry counters of PF1 & PF 10 at Secunderabad station. It facilitates the enquiry staff to have instant information on incoming/outgoing trains at SC station, before making announcement. 9. Two Nos. of cabinet speakers have been provided and extended Public announcement facility near Cyber cafe entrance on PF1 at Secunderabad station. 10. CMS (Crew Management System) connectivity have been extended for KIYOSKY’s at ELS/LGD, Crew Lobbies of SC, DKJ, BDCR and MUGR station for Signing ON/Signing OFF of crew.